Coping with Stress at University comprehensively covers the main problems and stresses that a student may experience during their university career. Looking at university life from a variety of angles, this book equips the student to be able to deal with stressful situations ranging from exam pressure to relationship problems, from homesickness to managing finances. Quotes and case studies from previous students illustrate how problems have been dealt with in the past, and a number of coping techniques and exercises are provided to help prepare students for the transition into and through university life. 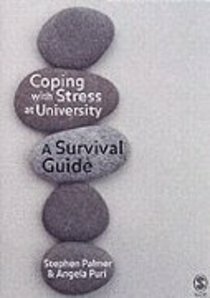 About "Coping With Stress At University"
Stephen Palmer, is one of the UK's most influential experts on stress management. He is Founder-Director at the Centre for Stress Management and Honorary Professor of Psychology at City University, London. He has written or edited over 30 books on stress management, psychotherapy and coaching.